An Ethos of Compassion and the Integrity of Creation addresses how to reconcile the lawful order seen in the world, which the Institute for Christian Studies takes as given by God, with the need for human compassion, also called for by God. The Institute sponsored this book in celebration of their twenty-fifth anniversary. An Ethos of Compassion and the Integrity of Creation opens with a study of parables relevant to today and closes with a meditation by Langdon Gilkey on the ideas brought forth in this book. 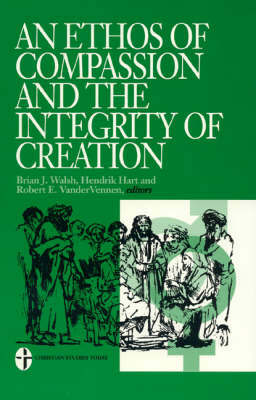 A study of the history of the idea of "creation order", central to the Institute's philosophical tradition, is followed by a controversial challenge suggesting how that philosophical tradition can be changed to give centrality to the viewpoint of compassion toward vulnerable people and the physical environment. Medical ethics, the environment, and gender chauvinism serve as case studies for issues of compassion and created order. Contributors: Atie Th. Bruggemann-Kruijff, Adrienne Chaplin, Jonathan Chaplin, John Cooper, Calvin B. DeWitt, Harry Fernhout, Langdon Gilkey, Sander Griffioen, Caroll Guen Hart, John E. Hare, Hendrik Hart, Sylvia C. Keesmaat, J. Richard Middleton, James Olthius, Elaine Storkey, Johan van der Hoeven, Allen D. Verhey, Brian J. Walsh, Albert M. Wolters, Nicholas Wolterstorff. Copublished with the Institute for Christian Studies.